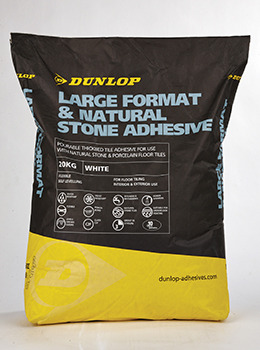 Dunlop Large Format & Natural Stone Adhesive is specially formulated for use with natural stone and large-format tiles. A pourable thick bed adhesive, it can be used inside and out – including on patios. Water and frost resistant, it is also flexible, meaning it can be used over underfloor heating. It can also be used to level uneven floor – before fixing tiles, a layer of adhesive can be applied up to 25mm thick. Because it can be used from 3-25mm thickness, it is also ideal for tiles/slabs of uneven thickness and uneven surfaces. It is available in grey and white – perfect for translucent natural stone, such as terrazzo. 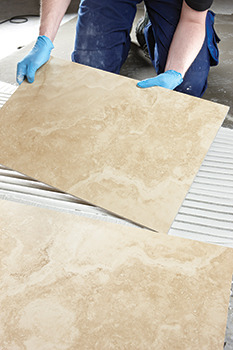 Dunlop Large Format and Natural Stone Adhesive is also rapid setting, meaning tiles can be grouted after only three hours, says the company. Exceeding the requirements of BS EN12004 for a C2F tile adhesive, it is easy to mix and easy to apply and can also be used for wet areas such as showers and swimming pools. As well as providing the perfect adhesive for natural stone tiles such as limestone, slate and marble, it can also be used with fully vitrified tiles such as porcelain thanks to its PorcelBond technology.